Honda Cars Philippines (HCPI) is also opening a new dealership in Naga City by the second half of 2013. The dealership, owned by Jeremie Lo, is to rise along the National Highway in Pili, Camarines Sur. The news comes right after the carmaker recently announced that it was also opening a showroom in Tacloban City. 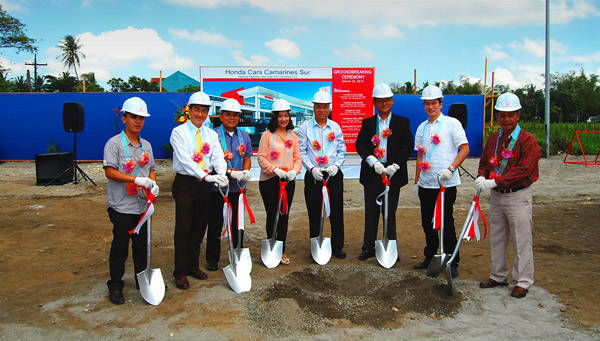 Marking Honda's official entry in the Bicol region, HCPI's ground-breaking ceremony was held on March 12. Honda is to offer to Bicolanos access to its full lineup of products, service technicians, sales associates and customer relations officers. HCPI president and general manager Tatsuya Natsume and Honda Naga City owner Jeremie Lo attended the ground-breaking ceremony. Pili mayor Tomas Bongalonta also graced the event.